Sunshine calls for the perfect spot to unwind, your own one of a kind summer house. At Warehouse 701, we cannot emphasize enough our love to recycle, restore, re-craft and re-home. Some incredible items are salvaged and we are determined to reuse as much as possible. We also love history, the old treasures we discover and the stories that these items hold. With the sun finally beaming down, it's the time of year when we look forward to early sunny mornings, late light evenings, BBQs with friends and family, alfresco dining and some much needed time in our gardens. What better way to unwind in dreamy botanical settings surrounded by plants and nature than in your own revolving summer house, beautifully restored. If you've visited Warehouse 701 you may have already seen this unique piece in person but let us share some more information regarding this build. Our gorgeous Boulton & Paul revolving summer house has been lovingly restored to its former glory from the ground up. You would be hard pressed to see that some of the components are over 100 years old! 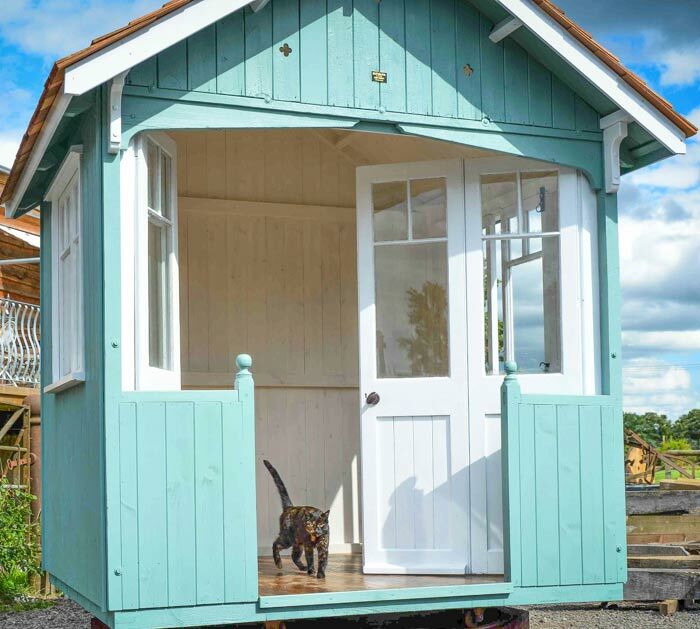 Only a few key elements of the summer house remained when it was salvaged from behind some out buildings locally in Lea, Ross-On-Wye. The original folding doors, the front elevation, the iron chassis wheels and track were all repaired, refurbished and re-used. The timber floor and windows were too far gone to salvage but they were ideal to use as patterns to craft exact replicas. Given a light push in either direction, the house revolves smoothly on its tracks in a full circle, allowing it to face the sun at any time during the day. This exquisite garden retreat will be a feature to last another lifetime. Be sure to have a look on our site for more information on how to make this yours or come and visit and see this phenomenal piece in person. Please note Darren the cat is not included.